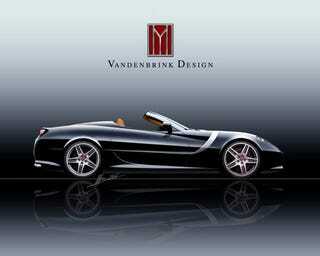 Dutch custom car maker Vandenbrink, which specializes in cars we'll never be able to afford, has released the first image of its GT Convertible. Based on the 599 GTB Fiorano, this stallion for the well-heeled is going to feature a custom lightweight carbon fibre folding hardtop to keep things inside the cabin when cruising turns into shredding. Other than that we're a bit short on details, though it's rumored the engine will come out of the Edo Competition 599, which could mean power in the 650 to 750 hp range.